The classic Nintendo video game console had one game that really boosted up it’s poularity, any guesses? Well I am sure most will say the awesome Nintendo game Super Mario Bros is the answer. 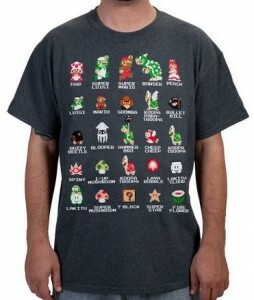 This t-shirt features the cast of this classic video game, a picture and a name for 50 different characters and objects looking just like they do in the game as 8-bit.. Find Mario, Luigi, Princess Peach, Bowser, super mushroom, fire flower and many more. This t-shirt will be both durable and comfortable, it is available in a huge variety of sizes. Have some throwback fun with the classic Super Mario Bros Cast T-Shirt.